I’m in love and I don’t care who knows it. I want to dance in the streets. I want to yodel on the rooftops. I want to pretend my immersion hand blender is a microphone and spin around the kitchen singing. Why all the fuss? I have found the perfect brisket recipe. That’s right, you heard me. I am in love with a brisket. (Fortunately, Soren is in love with it too, so there’s no awkwardness, and nobody has to leave anybody over a piece of meat). To be perfectly honest, it’s not so much the brisket that has me swooning as it is the sauce — a silky-smooth, coffee-colored concoction that’s the perfect blend of smoke and spice. Placed atop the brisket on a warm corn tortilla with a few slices of pickled onion and some cabbage slaw, it’s the perfect food. Seriously. Angels sing. The heavens open up. Saint Peter descends, leaving the pearly gate unattended while he fixes himself a plate. It’s that good. Serves 6-8 as filling for tacos. Pre-heat the oven to 325 F. If using grass-fed beef, 310 F.
Season the beef generously with salt and pepper, to taste. Heat a large, heavy skillet over medium-high heat. Add the oil and heat just until beginning to smoke. Add the meat and sear, turning once, until browned on both sides, about 10-14 minutes total. If the brisket has a layer of fat on one side, sear that side second. Transfer the meat to a dutch oven; leave the skillet on the heat. Add garlic, onion, chili powder, coriander, and cumin to the drippings in the skillet and stir until fragrant, about one minute. Add vinegar and boil until it’s almost gone, scraping the bottom of the pan with a wooden spoon. Stir in water and pour the mixture over the brisket. Crush the tomatoes through your fingers into the dutch oven; add the tomato juices, chipotles, bay leaves, and molasses. Cover, and place in the oven for 3.5 hours. Check for tenderness by sticking a fork in the meat. The fork should slide in easily. The meat should be nearly falling apart. If the brisket isn’t quite tender, put it back in the oven and cook for another 30 minutes to an hour. This kind of beef is nearly impossible to overcook. I usually leave the meat in the oven for a total of 4 hours. Also, you may need to add a little more water before you put it back in the oven. The meat should be at least halfway submerged in the juice. When the meat is fully cooked and tender, pull it out of the dutch oven and put it on a platter covered with tin foil. Let it rest while you make the sauce. To make the sauce: First, fish out the bay leaves. Then skim off any fat that has collected. (You can also chill the sauce if you want to remove even more fat. It will harden in the fridge and you can easily remove it). Use an immersion blender, regular blender, or food processor to grind up everything left in the dutch oven. This should be all the juices and vegetables minus the bay leaves. When the sauce is completely blended, reheat and serve with the brisket. Crockpot version: Instead of putting everything in a dutch oven, put it in a crockpot. Set it on LOW, and cook the brisket until it pulls apart easily with a fork, about 8 to 10 hours. 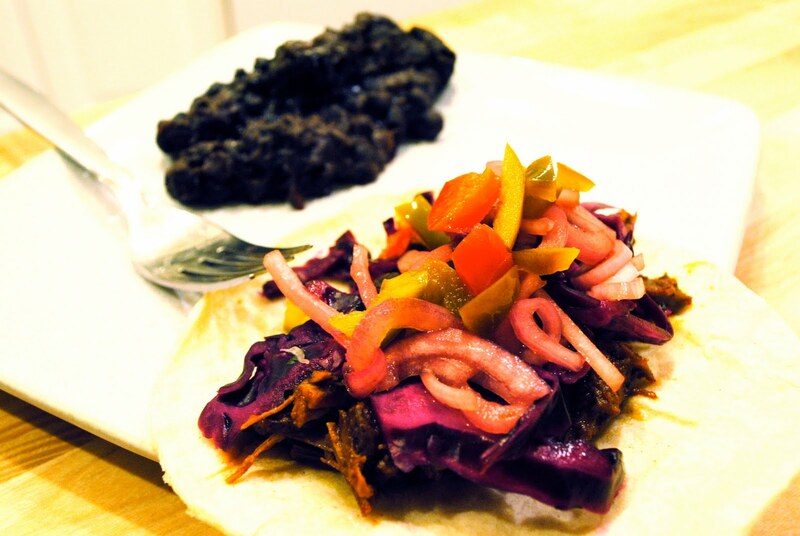 This brisket is great on its own, but it is even better on a corn tortilla with a dollop of sauce, some pickled onions, cabbage slaw, and black beans on the side. I highly recommend Deb’s recipe for pickled onions. And make sure you salt the cabbage before you make the slaw. My photo is the photo of the day on the neighborhood blog! I snapped this with my new Nikon d3000 DSLR during the snowstorm we had last week. 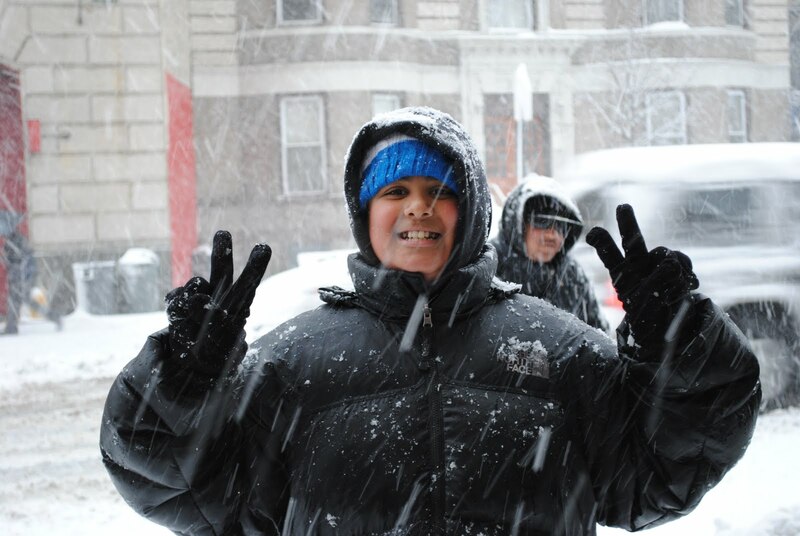 This kid ran up to me and said, “Hey, take my picture!” You don’t have to tell me twice, kid. When I was a child, I had a friend named Emily. (Actually I still have a friend named Emily, but no matter). Emily had a house that had a furnished basement. And the furnished basement had a fridge that contained rows and rows of tiny green bottles filled with a deliciously zingy liquid called Bitter Lemon. It was, if I remember correctly, her father’s favorite drink. And soon after Emily first introduced me to Bitter Lemon, it became my favorite drink too. Of course, access was a problem. I could drink as much as I wanted at Emily’s house. But my house didn’t have a furnished basement. And it certainly didn’t have a fridge stocked with Bitter Lemon. So I would binge and then go through prolonged periods of withdrawal. Finally, after some not-so-subtle hints, Emily would invite me over again, and the cycle would begin anew. That is, until I hatched a brilliant plan. The plan was relatively simple: I would beg. Through feverish bouts of shameless begging, I hoped to convince my father to drink Bitter Lemon, or at least to buy Bitter Lemon so that I might drink it. And lo and behold, it worked. Of course, unlike Emily’s family, we never had an entire fridge dedicated to Bitter Lemon. At my house, it was a special treat. Mostly I remember drinking bottle after bottle when we canoed the Wisconsin River. The adults would crack the cooler and pull out their adult bottles of beer (or plastic cups of strip-and-go-naked) and I would kick back with my icy-cold bottle of Bitter Lemon. We would sip our drinks, nod knowingly, and watch the world float by. It was magic. Then, tragedy struck. Bitter Lemon disappeared. First there was a hole on the store shelves where the tiny bootles had been. And then even the hole was gone, filled in by something disgusting — grape soda, no doubt. 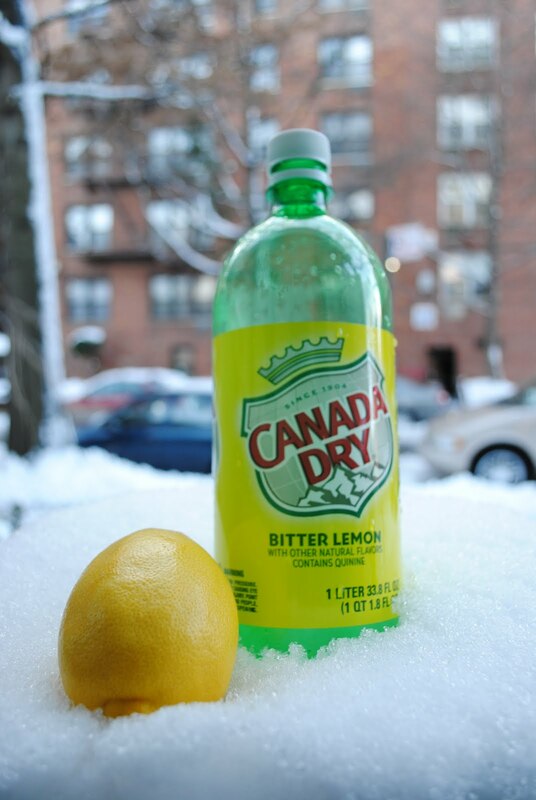 So you can imagine my surprise and UTTER delight when, last week, I discovered Bitter Lemon at Duane Reade. At the PHARMACY for crying out loud! “What are you DOING here? !” I exclaimed, clutching the one-liter bottle to my bosom. And then I took it home. We had a delicious reunion. Bitter Lemon tastes just like I remember. Why yes, Tommy, you can go home again.